If you can't build a freeway, widen the streets instead. Remember back in 2017 when the 710 Freeway North $6 billion tunnel project was rejected by the Metro board? among several types of improvements the motion specifically names: transit and rail capital improvements, bikeways, and pedestrian improvements. The funds will go to projects in the cities along the corridor where the freeway tunnel would have been: Pasadena, South Pasadena, Alhambra, La Cañada Flintridge, and the city of L.A. neighborhood of El Sereno. Adjacent cities expected to experience traffic changes were also included: unincorporated East L.A., Monterey Park, San Gabriel, San Marino, Rosemead. These municipalities submitted project lists to Metro. In accordance with the language in the motion, cities submitted a broad range of transportation projects. Many were focused on cars, including: street widening, intersection capacity expansion, freeway ramp reconfiguration, signal synchronization, and parking structures. Many projects embraced the multi-modal options, including: complete streets, Bus Rapid Transit, shuttles, bikeways, bike-share, and student transit passes. The full list of projects totaled $1.2 billion. Available funding is now anticipated to be $730 million, with some additional funds expected from the sale of state-owned properties – though that funding is controlled by the California Transportation Commission. Metro staff picked projects to move forward under an initial $350 million. The selection process was completely opaque, with no project scoring or ranking, no specifics regarding how projects were selected. Thirteen projects to widen and increase the car capacity of roads, including grade separating the Gold Line at California Boulevard – to increase car through-put on California. Six projects to increase the car capacity of intersections, mostly adding more dedicated turn lanes, but also adding a roundabout at Boyle Heights 5-way “cinco puntos” intersection of Cesar Chavez Avenue/Lorena Street/Indiana Street. Every single project is about adding car capacity. This raised the ire of many groups working to make these communities more livable. Nine organizations, including Bike SGV and Investing in Place, signed a letter urging the Metro board to reject the staff recommendations. The letter is critical of Metro’s lack of community outreach, lack of transparency, failure to acknowledge disadvantaged and pollution-burdened communities, and broadly a failure to acknowledge any mobility other than driving. Testifying before Metro’s Congestion, Highway and Roads Committee meeting yesterday, Investing in Place Executive Director Jessica Meaney called the proposal a throwback to “old school Metro.” Climate Resolve Associate Director Bryn Lindblad termed it “doubling down on car dependence” with no acknowledgement that road widening induces car travel, and worsens congestion, health, pollution, and greenhouse gas emissions. 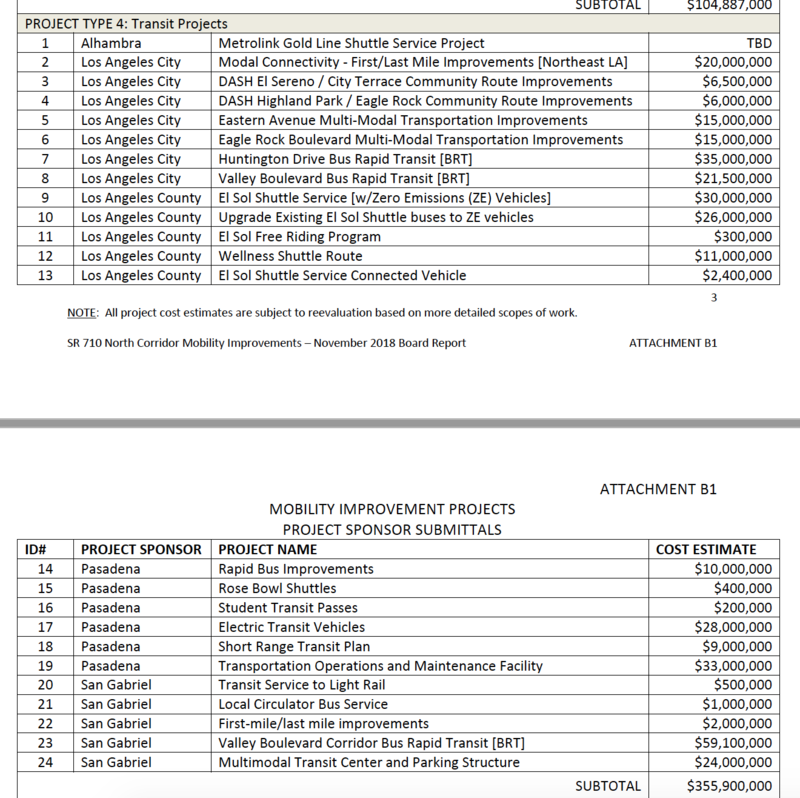 In justifying their selected projects, Metro staff asserted that transit projects were not “economically sustainable.” For some reason, staff did not apply this criteria to car capacity projects, implying the oft-repeated falsehood that road projects or parking structures somehow pay for themselves. Staff acknowledged that more-or-less the entire list of projects needed more study and more scoping, but then justified not including certain livability-minded projects due to “vague scoping.” Staff questioned whether non-car projects were justified, though without any clarification of what justification criteria was being used. It was not named, but the justification seems to be the outdated and inaccurate Level of Service metric that only measures car capacity. Metro director Jacqueline Dupont-Walker raised some concerns over the lack of transparency in the process, and the lack of “multi-modal or safety” projects as specified in the motion. Dupont-Walker appeared comfortable that green transportation projects remained on the table for consideration in later rounds of funding. Alhambra Mayor Jeff Maloney testified before the committee urging that Metro fund removing the stub-end of the 710 just north of the 10 Freeway. Staff asserted that the locals needed to study that project further. The committee amended the staff proposal to include this project, at an estimated cost of $100 million. The Metro Roads Committee approved the staff recommendation – as amended. The proposal will go to the full board meeting on December 6. It is astonishing that Metro’s zombie engineer road-builders do not seem to grasp any broader implications of the rejection of the North 710 Freeway project. They were hell-bent on building ridiculous astronomically-expensive tunnels opposed by the communities they were intended to serve. When the tunnels bit the dust, they were directed to implement the balanced multi-modal vision professed by CEO Phil Washington, the Metro board, Metro’s strategic plan, and made urgent by the currently blazing climate crises. Instead of looking towards a healthier future, they offered only narrow-minded 1950s solutions that will worsen congestion and pollution. Some of the things includes are bizarrre. The top 5 items on the list – reconfiguring on and off ramps from the 10 in Alhambra – were just done as part of the HOT lanes construction. Caltrans made a mess of the off ramps (and should be the one to fix them). I do support grade separating the Gold Line at California as long as it considers safety and friendliness of the crossing for people walking and biking. where can we go to comment on this before it goes to the full board. Bike lanes and bike “highways” should be at the top of their list rather than adding turning lanes for more cars. I thought LOS was dead in California? No bus lane on Atlantic….? Can’t wait to see the EIR on all these projects, or have they all been included in the General Plans of the various cities? Your logo should properly show SR 710 NOT Interstate 710. Interstate 710 (I-710) runs from Long Beach to the I-10 (San Bernardino) Freeway. State Route 710 (SR-710) runs from the I-10 to Valley Blvd. in Alhambra. This also includes the SR-710 stub in Pasadena. This may sound insignificant but it is vitally important. The Draft EIR and the upcoming final EIR are concerned with the SR-710–they have nothing to do with the I-710. The Committee report which you speak of here refers to the proposed projects as the “SR-710 North Corridor Mobility Improvements”. I do appreciate your views on the proposed projects. haha, no! Some of them literally were envisioned with zero public input. Thanks. This is just terrible. I can’t be there tomorrow but I hope somebody is to speak about how backwards this all is. This morning the Metro board of directors voted to approve a motion that effectively kills the $6 billion 710 North freeway tunnel project and redirects its funds to soundwalls, resurfacing, transit, signals, and bicycle and pedestrian improvements.